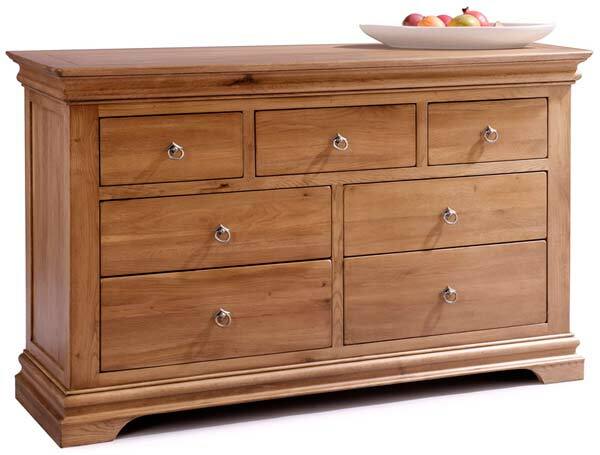 Sleepcraft Chambra 7 Drawer Multi Chest would compliment any bedroom, dinning room or lounge and is available with a range of matching furniture. The Chambra range of bedroom furniture is made from a mild oak and is slightly lighter than the Phillipe range. All pieces of Chambra Furniture range come fully assembled except for the wardrobes and bed frames. It is made from solid oak and Palomio which is a indigenous hardwood. All the drawers are dove tailed and finished with brushed silver colour handles.